Huawei has unveiled the latest entry into its flagship P series of smartphones: the P30 and P30 Pro. Both handsets includes a number of upgrades over their predecessors, including the faster Kirin 980 chipset that debuted with the Mate 20 Pro, a smaller notch in the display, better battery life, and improved cameras. Huawei claims the updated cameras on the P30 series have "rewritten the rules of photography," but while the P30 Pro gets closer to living up to this overweening tagline, the P30 certainly doesn't. Instead of rewiring any rules, the smaller sibling is content to catch-up with all of the camera features that were reserved for the Pro variant last time around. And that's absolutely fine with us. Picking up the Huawei P30 for the first time, it's immediately clear this is a premium product. The days of the slightly cheap, hollow-feel to the aluminium cases of the likes of the Huawei P9 and P10 are long gone. It's also clear that Huawei's muse has changed in the last few years: whereas earlier P series devices looked like an unconvincing police E-FIT of the latest iPhone, the P30 feels much closer to the latest entry in Samsung's Galaxy S range. That's mainly due to the dual-curved display that wraps around the front of the device – a trademark design quirk from Samsung, which most recently featured on the Galaxy S10 and S10 Plus. This makes the sizeable 6.1-inch FHD+ OLED screen that dominates the front of the Huawei P30 feel surprisingly manageable. Don't get us wrong, if you've never liked big-screen phones, the slight curve of the glass display – which is beautifully mirrored on the glass rear case of the handset – won't be enough to convince you. But it will help those looking to upgrade from the Huawei P20, which has a 5.8-inch screen, and are a bit worried about the step-up in size. The display looks great – it's colourful and vibrant. And yes, it's not the sharpest display on the market right now, but at normal viewing distances – namely, at the end of your arm – it's absolutely fine. Obviously, it's not as nice as the AMOLED panel on the Galaxy S10, which is truly staggering and easily a better viewing experience. However, the P30 is much nicer than anything on the Google Pixel range, which still has an unfriendly cold-look about it, and none of the pop of this panel. To accommodate this larger 6.1-inch display, Huawei has slimmed down the small notch at the top of the display – very much like what OnePlus did when it moved from the OnePlus 6 to the OnePlus 6T last year. The fact that the Huawei P30 has the same display size as last year's Huawei P20 Pro pretty much epitomises what this smartphone is all about. The entry-level P30 has inherited many of the features that were reserved for the pricier Pro variant last year. As such, the P30 gets an improved version of the triple-camera set-up that debuted with the P20 Pro last year. That triple-camera is comprised of a 40-megapixel f/1.8 wide-angle "SuperSpectrum" sensor, coupled with a 16-megapixel ultra-wide angle, and an 8-megapixel telephoto lens. The resulting camera can photos with a 3x lossless optical zoom. In our initial test with the P30, that zoom works just as advertised and should let you get shots that you wouldn't be able to achieve with almost any other smartphone. We were bowled over by the camera capabilities of the P20 Pro, and the entry-level P series this time around only improves on that. Also, if you were confused by the term "SuperSpectrum" used to describe the main wide-angle sensor – don't worry, it's marketing bumf for the new camera technology Huawei has developed for the P30 series. Key to that new approach is ditching the RGB (Red-Green-Blue) sensor that literally every other phone camera on the market currently uses in favour of a RYYB (Red-Yellow-Yellow-Blue) variant. It turns out Yellow sensors can absorb twice as much light as their Green counterparts. By including two in the new set-up, Huawei will be able to collect more information than any of its previous cameras. As you might expect, ditching the standard-issue RGB configuration requires a pretty fundamental rethink on how to process the information gathered by the camera. Huawei says they've been working on this technology for years, but it's only just managed to bring the solution to market. It wasn't simply a case of swapping out the sensors for an RYYB variant, either. Huawei had to completely rework how its flagship Kirin 980 Image Signal Processor handles input from the camera to make sense of the date. The company clearly believes all this work will result in much more detailed images, with better low-light performance. In our brief time with the Huawei P30, the camera looks as good as you would expect from the creators of the Huawei P20 Pro and Mate 20 Pro, which was – until very recently – our favourite Android smartphone on the planet. Pictures are very sharp, with vibrant colours. The results aren't quite as ziggy and over-saturated as what you get from the latest Samsung Galaxy ... and that's a compliment to the P30. Huawei says it's now using a combination of Optical Image Stabilisation (OIS) and AI-powered digital stabilisation to remove any trace of a wobble from your stills and videos. It will also help to remove blur from shots taken with the dedicated Night Mode, which keeps the shutter open for longer to draw-out more light. There's also a new Super HDR mode on the front-facing 24-megapixel camera, which is designed to preserve details in the shadows and highlights better than its predecessor as Huawei understands that can't always face into the light source during a video call, or to nail the perfect selfie. Obviously, we'll need to spend more time with the Huawei P30 camera out-and-about before we deliver our final verdict. However, from what we've seen so far, it looks like this is a solid, albeit iterative, update on the P20 Pro. And that's high praise. As you'd expect, the latest flagship smartphone from Huawei is running its latest operating system. Dubbed EMUI 9.1, the software is based on Android 9.0 Pie. We've got no qualms about the performance of EMUI 9.1 on the P30 – it runs extremely well on the hardware and offers a pretty comprehensive package of features you'd expect from a flagship smartphone in 2019, including granular controls on third-party app permissions, contactless payment options. There's also a glut of Huawei-specific features, including the ability to copy something on your phone and paste it immediately using the standard "Ctrl + V" keyboard shortcut on your MateBook laptop, which is pretty nifty. However, EMUI still isn't attractive software, by any stretch of the imagination. The cartoon-ish design (and not in a charming way, either) looks outdated and infantile. When compared to the Android experience offered on the likes of the Google Pixel, OnePlus, or the new OneUI software powering the latest-generation of Samsung Galaxy handsets, EMUI looks astonishingly subpar. 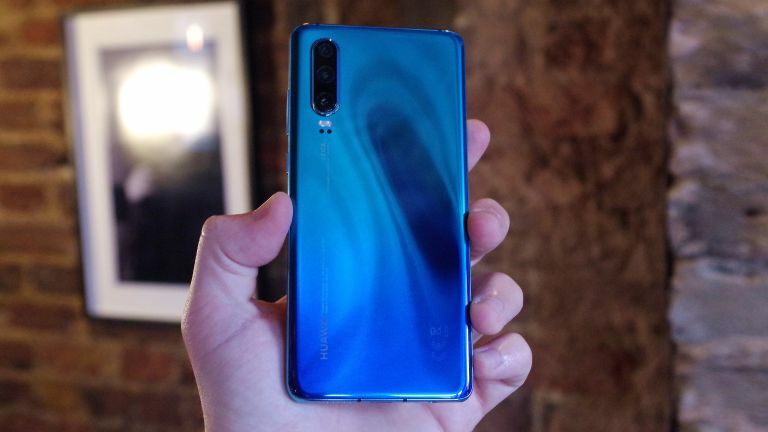 In keeping with the iterative nature of the P30, Huawei has kept the "gradient" colour finishes on the rear case introduced with the P series last year. That is music to our ears. The new colourful cases on the P30 are absolutely stunning and really help it stand out from the sea of indistinguishable aluminium Android devices. It feels borderline criminal to put a case on the P30 and hide the gorgeous fusion of colours that seem to show a different combination of shades each time it shimmers in the light. Huawei P30 ships in Breathing Crystal, Amber Sunrise, Pearl White, Aurora, and plain ol' Black for those who don't fancy a glimmering, colourful finish. There's also fast-wired and fast-wireless charging, as well as the reverse wireless charging that debuted with the Huawei Mate 20 Pro last year. The latter lets you charge other Qi-compatible devices, like the Samsung Galaxy Buds or second-generation Apple AirPods, on the rear case of the smartphone. Thankfully there's a hefty 3,650mAh battery cell to keep your device – and the devices of any useless friends who forgot their charger – ticking along. That's a step-up from the 3,400mAh cell included in its predecessor. According to Huawei, the advances in AI and battery management brought about by the Kirin 980 and the latest Android software mean the P30 will manage even better than the P20 Pro from last year, which had a bigger 4000mAh cell. Clearly, we'll need to spend some serious time sending emails, answering texts, checking social media, and all the other daily battery drains to get a real sense about the battery life, but based on what we've seen from previous Huawei-branded flagship devices, this looks very promising. If you've been thinking about buying the Huawei P20 Pro for its impressive triple-camera and 3x lossless optical zoom, it's probably worth holding on just that little but longer and opting for the Huawei P30 instead. The P30 series' smaller sibling touts the same phenomenal camera functionality that allowed the P20 Pro to land a prestigious five-star review, but now captures more detail and performs better in challenging low-light conditions. There's also an improved front-facing camera with Super HDR for high-res selfies to bore your social media followers and crisper video calls with loved ones. So long as Huawei's battery life claims bear scrutiny, it's worth plumping for the Huawei P30 over the P20 Pro for that sheer stamina alone. It also has a faster in-display fingerprint sensor than the one on the Mate 20 Pro, and more of the gorgeous gradient colour finishes that were introduced last year. If we're being picky, the IP53 water resistant and dust resistance is a little disappointing. For a flagship handset at this price – and with this amazing camera technology – we really wish the P30 could survive more than a few drops of rain. Those looking for the best smartphone camera technology that Huawei has to offer won't be satisfied with the P30, especially given the huge advances seen on the P30 Pro. But for anyone who couldn't justify the cost of the Pro variant last year will find all of the same features, with some worthwhile iterative tweaks, right here. Oh, and unlike the P20 Pro, the Huawei P30 has its 3.5mm headphone port reinstated. So you can use all your old wired headphones, speakers and in-car infotainment adapters without a dongle. Lovely stuff.